The seven boats of the Trafalgar-class have served the Royal Navy's fast-attack submarine role since the early 1980s. This kit marks Airfix's first foray into submarines, and it's a nice freshman effort. Molded in blue-gray plastic, the parts show sharp if slightly heavy-for-scale engraved panel lines on the deck. Trafalgar-class subs are covered with anechoic (sound-absorbing) tiles designed to reduce the vessel's active and passive sonar signature. They are visible in photos, and the Royal Navy boats often show sections of damaged or missing tiles. Airfix hasn't attempted to replicate these, either in place or missing, but that's not a bad thing it would be easy to overdo them, and they are probably better represented with paint. The kit has several options, including deployed or stowed bow planes and flagstaffs. Two different sail tops are included, one with everything closed up and stowed, the other with the periscopes, snorkels, and everything else deployed. The kit also provides two different propulsion systems the open-bladed screw used on HMS Trafalgar, and the pumpjet system used on subsequent vessels of the class. Decals represent depth markers and hatches and provide names of all seven submarines in the class. Construction is straightforward. I anticipated problems with the two-part lower hull, but the soft plastic responded very well to Tamiya liquid cement and the gap all but disappeared. I opened the holes for the bow planes. Both the bow and stern planes are designed to be movable, but I found the plastic a little flimsy and the fit a little tight, so I glued them in place. The single-piece upper hull attached as cleanly as the lower hull halves, although I used rubber bands to ensure tight joins. A little putty eliminated any trace of the seams in the hull. The sail, fins, and propulsion unit attached cleanly. It took me less than two hours to have the sub ready to paint. After a couple of shades of black and Pledge Future floor finish, I applied the decals, which performed very well. I used Micro Sol to get the hatch marking to conform to molded detail. I was impressed by the brightness of the red and yellow markings. After adding the sail-top equipment and setting the model in its sturdy cradle stand, I had an HMS Turbulent ready for display. 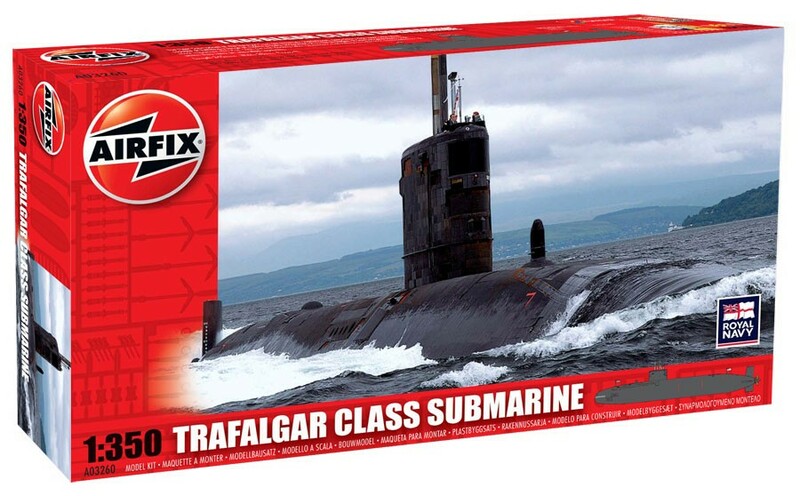 Airfix's Trafalgar-class sub isn't a big model. But it's an easy build with enough potential for detailing and display to provide plenty of fodder for advanced modelers.